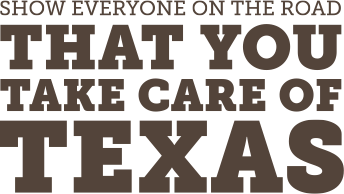 This year the TCEQ’s Take Care of Texas program received the most entries in the contest’s history, with six videos beating 511 other entries. Taking the top prize in the high school category is Dominique Barraza from Pebble Hills High School in El Paso. First place among middle schoolers is Vibhas Chinta, who attends Vista Ridge Middle School in Fort Worth. The large number of entries is more than double the entries received last year, and indicates students’ growing interest in demonstrating how to help keep the air and water clean, conserve water and energy, and reduce waste. A panel of judges worked diligently to pick just 12 finalists from the initial pool of 517. Members of the public voted on the 12, and the 1st, 2nd, and 3rd place standings were decided by TCEQ commissioners, executive staff, and representatives from the contest partner, Waste Management of Texas, Inc.
View the videos at TakeCareofTexas.org. Prizes generously donated by Waste Management of Texas, Inc. will be presented to the first place winners on May 15, the final day of the TCEQ Environmental Trade Fair.